Mother's Day will be here before we know it! Personally, we keep it simple around here, but I've come up with a variety of gifts on all ends of the price spectrum. 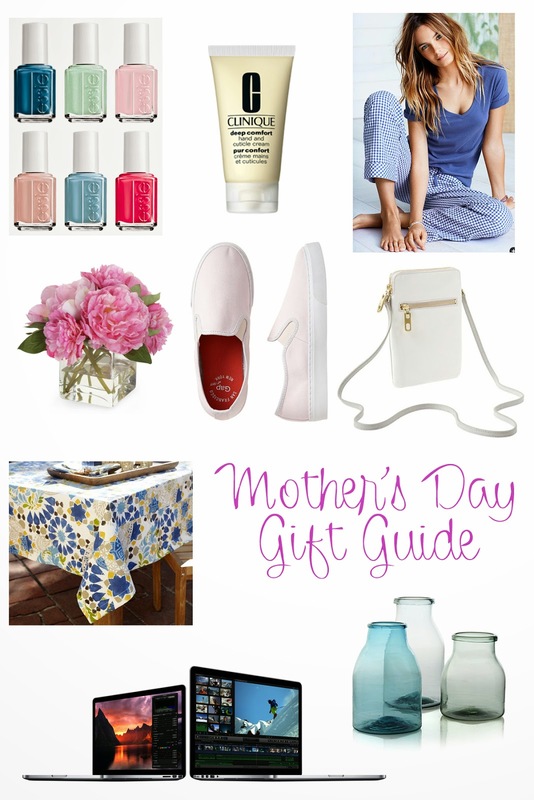 Personally, I think there are a few types of gifts that work well for Mother's Day. I like gifts for the home, fashion type gifts, and things to help pamper. I also think homemade gifts and some flowers are always appreciated. I don't know a woman who wouldn't like some new nail polishes. It would be cute to put a little bag together with some of their favorite smaller beauty products. Or you could get them a gift card to their favorite nail salon for an afternoon of pampering. I can never get enough PJs. Personally, I prefer the comfortable and practical PJ pant and t-shirt. Even though they don't last long, I love getting flowers for Mother's Day. Maybe it's because I LOVE peonies and they aren't in season for very long, but I would be happy getting these every year! For me, I've been picking more practical items to wear recently, so I was immediately drawn to a slip on sneaker and a cross body bag. But this idea could work for any mom. Pick out something you think they'd like, or even get them a gift card to their favorite store. I know my mom loves getting things for the house. A lot of times these are items that we don't usually buy for ourselves since they sometimes seem a little unnecessary. But really, who doesn't love a new fun item for the house. I know this last gift is a major splurge. But I actually just ordered myself a new laptop and it will be arriving next week. My current one (which I've had for 7+ years) is constantly running out of space and recently it's started shutting down when I'm in the middle of things. Chris and I have been making some large purchases lately, so we've taken on the attitude that these large purchases will also be considered gifts for certain holidays (i.e. Mother's Day, Father's Day, Anniversary, etc.) which is TOTALLY fine by me! What are you planning to get your mom? What would you love to get from your kids? If you could email this list to my husband, that would be amazing! :) lol. But in all seriousness, I hope you get a MacBook Pro! LOVE mine! Oh and don't forget Apple One to One! Love this list! I'll take some nail polish, pj's, & vases please!